Helen Forrester was born in Hoylake near Liverpool, England in 1919, less than six months after the end of the First World War. Her parents’ upbringing and her father’s long war service had not prepared them well for parenthood or peacetime in the hedonistic 1920’s. They had six more children and lived well beyond their means mainly in charming towns and villages in the south of England. When her father was made bankrupt during the Great Depression, the family was thrown into desperate poverty. Evicted from their comfortable home and with nothing more than the clothes they stood up in, the large family took the train to Liverpool where they hoped to rebuild their lives. While Helen’s father searched unsuccessfully for work, the family of nine lived together in a single room. As the eldest child, 12-year-old Helen was kept away from school to look after her six siblings. For the next few years the family was forced to rely on meagre handouts from the parish, and the kindness of strangers. At the age of 14 Helen rebelled against her life of drudgery and her parents agreed to allow her to attend evening classes to make up for her missed years of education. Twopence to Cross the Mersey tells the story of these difficult years. Helen continued to live with her family and worked in Liverpool until the end of the World War II. At first she worked for a charitable organization as an office girl and later became a social worker. Helen worked long hours and was still expected to do much of the housework while her mother kept most of her wages. Eventually she got a better job at a petroleum installation on the Liverpool waterfront, a very dangerous place to be during a war. She survived the heavy bombing of Liverpool but lost two fiancés during the war. Liverpool Miss, By the Waters of Liverpool and Lime Street at Two are Helen’s memoirs of this dramatic period. Living in the slums of Liverpool, and then working there as a social worker, Helen developed an intimate knowledge of, and great empathy for, the poor but fascinating inhabitants of the inner city. Later she wrote three novels based on this background: Liverpool Daisy, Three Women of Liverpool and A Cuppa Tea and an Aspirin. After the war, she began a career in the packaging industry but in 1950, she met Dr. Avadh Bhatia a brilliant young physicist from India who was completing his PhD at the University of Liverpool. She left Liverpool to get married in India and lived there for two years. She was fascinated by every aspect of life in India and expected to spend the rest of her life there. Two of her novels, Thursday’s Child and The Moneylenders of Shahpur are set in India and draw on her keen observation of Indian life. Dr. Bhatia’s academic career drew him away from India, first to Edinburgh, Scotland, then to Ottawa and finally Edmonton, Canada where they settled in 1955. Edmonton was booming and the University of Alberta was growing rapidly due to the discovery of oil in the region in the late 1940’s. Helen’s son, Robert (that’s me), was born a month after they arrived in Edmonton. Avadh was a professor of physics at the University of Alberta until he died in 1984. Helen began to write seriously in Ottawa and Thursday’s Child, originally titled Alien There is None, was published in 1959. Despite the demands of motherhood and of supporting a busy but physically frail husband, Helen persevered with her writing. She wrote The Moneylenders of Shahpur soon after her first book but it was not published until later. The Latchkey Kid, set in Alberta, was published in 1971. Twopence to Cross the Mersey was published in 1974 to critical acclaim. However, when it was reissued in 1979 it became a bestseller and established Helen Forrester as a major writer. Together, with the three additional volumes of her memoirs, Twopence was recognized as a highly innovative form of autobiography using Helen’s clear recollection and re-creation of direct dialogue which she confirmed with her siblings. Twopence to Cross the Mersey continues to attract widespread interest and has been made into a musical and stage play. Helen continued to write into her eighties producing eleven bestselling novels (and a romance novel) in addition to her memoirs. The University of Liverpool awarded Helen Forrester an honourary doctorate in 1988 followed by the University of Alberta in 1993. After moving to Edmonton, Helen resided there for the rest of her life except for 1963-64 and 1979-80 when my father spent sabbatical years at the University of Liverpool and Oxford University. However, Helen travelled frequently to the United Kingdom and maintained an active correspondence with her brothers and sisters, friends, as well as her agent, publishers, booksellers and numerous fans of her writing. 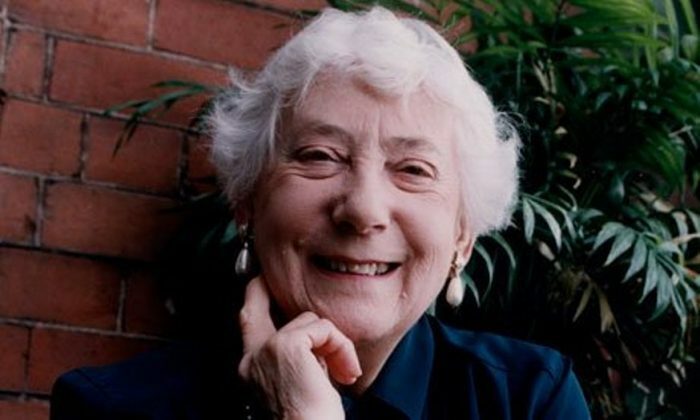 Helen Forrester died on November 24, 2011 in Edmonton, Alberta, aged 92. Read the The Guardian’s obituary of Helen. For her full life story read Passage Across the Mersey. Robert Bh atia is Helen Forrester’s son. He was a senior public servant in Alberta, Canada and now works as an Executive Coach. After five years in a basement surrounded by dozens of boxes of Helen’s papers, he has emerged with the book, Passage Across the Mersey.